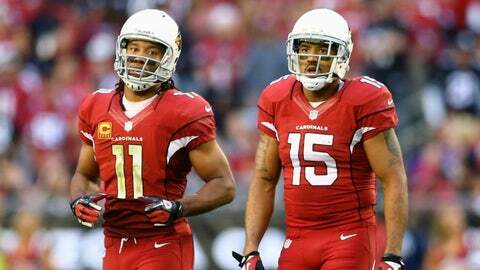 Cardinals wide receivers Larry Fitzgerald and Michael Floyd are expected to lead again next year. Fitzgerald fell just short of 1,000 yards receiving for the second straight season but caught 10 touchdowns and his production improved over the second half of the season as he and the rest of the offense grew more accustomed to Bruce Arians’ scheme. The Cardinals likely will approach Fitzgerald this offseason about restructuring a contract that will have a cap hit of $18 million in 2014. Fitzgerald has indicated he is open to such a move (but not a pay cut) so the guess here is it will happen, freeing up money for the Cardinals to pay other free agents and maybe sign cornerback Patrick Peterson to an extension. There is always the chance that the Cardinals could trade Fitzgerald, but it would be a PR disaster for a franchise to cut loose its well-respected icon in the prime of his career. Floyd started slowly but took the steps over the second half of the season that the Cardinals had hoped he would. He became a legitimate threat in his own right, which in turn opened up things for Fitzgerald and others. 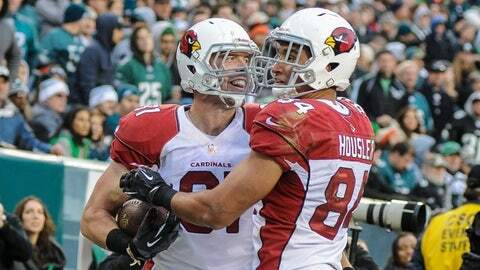 He led the Cardinals in receiving yards (1,041) and averaged 16 yards per catch. He only scored five touchdowns, but four came in the final nine games, which corresponded with the team’s hot stretch after a 3-4 start. Coming off the best season of his career, Roberts slipped to 43 catches for 471 yards and two TDs. It wasn’t that he was ineffective; he didn’t play as much in Arians’ tight-end friendly offense. Given that limited role and his price tag, Roberts probably will test the free-agent market and end up elsewhere as an effective receiver. Injuries prevented Golden (hamstring) or Williams (Achilles tendon) from filling the need for a speed receiver more than momentarily. That pair, as well as the Cardinals other receivers, will likely face plenty of competition in camp. If Roberts departs — a distinct possibility given his likely salary demands and his diminished role in the offense — the Cardinals will need a legitimate third receiver. Neither Brown nor Golden fits that bill (nor does anyone else on the roster). The Cardinals also could try to upgrade their speed receiver spot. The draft swing-and-miss on Ryan Swope, who retired before training camp due to concussion issues, still leaves a hole at that spot. The Cardinals again may try to find a speed receiver in the later rounds, or they could just sign rookie free agents to fill that bill. The thinking here is that they need a dependable, veteran player to fill the third receiver spot if Roberts signs elsewhere, not a rookie who will take too much time to learn the nuances of the offense and would represent a huge drop-off if either Fitzgerald or Floyd suffered an injury. But there are other roster spots available for lower picks. Sammy Watkins, Clemson; Mike Evans, Texas A&M; Marquise Lee, USC; Kelvin Benjamin, Florida State; Allen Robinson, Penn State; Odell Beckham Jr., LSU; Brandin Cooks, Oregon State; Jordan Matthews, Vanderbilt; Jarvis Landry, LSU; Davante Adams, Fresno State; Paul Richardson, Colorado; Martavis Bryant, Clemson; Bruce Ellington, South Carolina; Jared Abbrederis, Wisconsin; Mike Davis; Texas, Donte Moncrief, Mississippi; Brandon Coleman, Rutgers; Robert Herron, Wyoming; Jeff Janis, Saginaw Valley; Cody Latimer, Indiana.